"Here to care, when you're not there"
In today's world, with our busy schedules and long work hours, many pet owners have to leave their beloved pets home alone. We started Santa Clarita Pet Nanny with the mission to provide excellent care and love for your pets when you can't be there. Whether you need someone to walk and socialize your new puppy, or come by every day to visit and care for your cat while you're out of town, we'll be there. It's very stressful for your pets when you have to leave town, and most animals, (particularly cats) do not do well in new environments. Because of the stress, potential exposure to illness from other animals and the desire to maintain normal routines, many people decide to bring in an in-home pet sitting service. Your loved one can stay in his/her own comfortable environment and I will come to them. You can rest assure that we will care for your pets as you would, and hopefully relieve some of that guilt that most people feel when they have to leave their "kids." 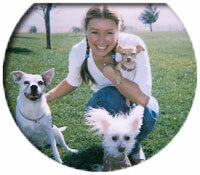 Santa Clarita Pet Nanny is Insured and bonded. We are proud members of Pet Sitter's Association, LLC (PSA), ASPCA, Humane Society of the United States, and Best Friends Pet Animal Society. We service the entire Santa Clarita area, including Valencia, Canyon Country, Newhall, and Saugus. I am a professional dog trainer and I work with animals for TV and films. I spent 10 years working on the hit TV show "Married...With Children" as the owner and trainer of "Buck" and "Lucky". Gwen started working as my assistant in 1996 and worked the last two seasons of the show, as well as other animal entertainment projects. Gwen has continued to care for my own personal pets whenever I am on location or must be away for extended amounts of time. To anyone who knows me, they know that my pets are like my children and, of course, my livelyhood. I trust Gwen with all my animals, which include dogs, cats, birds, horses, and a wolf. I would highly recommend Gwen. She is responsible, caring, and trustworhty. I would like to highly recomend Gwen Casey as your future pet sitter. She worked for my company,The Pawsitively Pampered Pet, in the San Francisco Bay Area for approximately 4 years. From the moment she started working for me I could tell that she was definiteley above average both as a pet sitter and a person. I found Gwen to be not only caring and loving to each and every pet she cared for, but also hard working, honest, and willing to go beyond the call of duty. In the world of pet-sitting almost every day brings new challenges: schedule changes, sick animals, different client requests, etc. Gwen always handled every situation with grace and professionalism.